Indian Summer in Color Efex Pro 4 is a great filter for isolating and stylizing greens in your image, allowing you to create warm colors that are reminiscent of fall’s colorful scenery. The filter does this by identifying the foliage/greenery while the filter controls let you stylize the image. This is a very quick and easy filter to use; the minimal controls, noted below, allow you to make a colorful change. The Method drop down menu enables you to control the color of the foliage throughout the image, using a range of reds and yellows. There are 4 Method options, and the filter is set to Method 1 as a starting point. 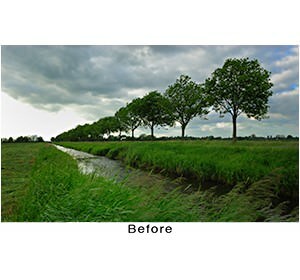 The Enhance Foliage slider controls how much of the filter is applied to the original image; 50% is the default value. Moving the slider to the left will reduce/remove any warm colors that have been introduced in the image, while moving it to the right will increase the enhancement of any warm colors. The best way to show the effect of the filter is using our color chart, with a range of R G B C M Y colors. Below you can see the base color chart – with no modifications. We will want to note the G and Y sections. Once we apply Enhance Foliage to the image (at 100% to exaggerate the change), we can then look back at the G and Y sections of the chart. You will notice how the greens and yellows have changed; they have become noticeably warmer (especially in the darker values). You may also notice a slight change in the cyans as well. Tip: Indian Summer is a great filter to use with landscape imagery, as this filter can be used to transform the green in any image. However, you may find the need to soften the effect of the filter. You can use the Opacity slider under the Control Points section to decrease the overall effect on the image. Just click to expand the Control Point section, and then adjust to your desired look.